The newly appointed head of Ukraine's navy has sworn allegiance to the Crimea region, in the presence of its unrecognised pro-Russian leader. 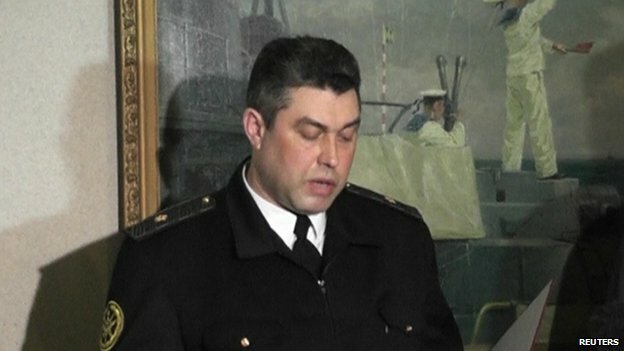 Rear Admiral Denys Berezovsky was only made head of the navy on Saturday, as the government in Kiev reacted to the threat of Russian invasion. 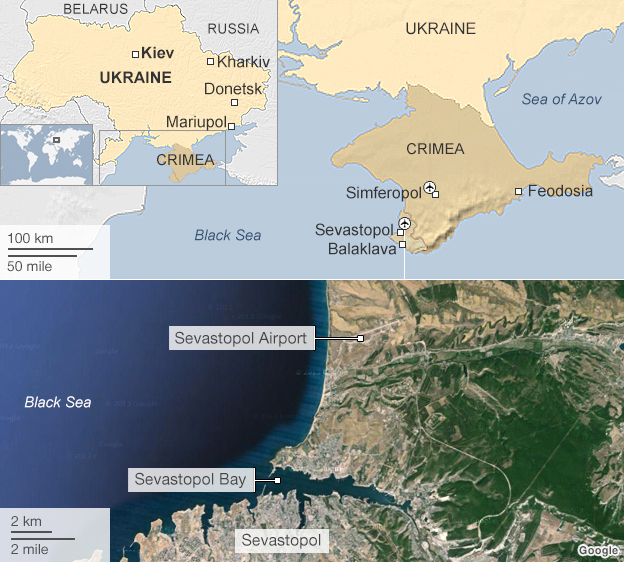 Russia's troops have been consolidating their hold on Crimea, which is home to its Black Sea Fleet. Nato's chief has asked Russia to withdraw its forces to its bases. 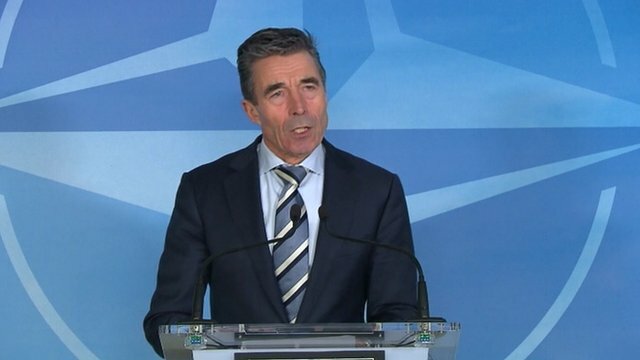 "We call on Russia to de-escalate tensions... to withdraw its forces to its bases and to refrain from any interference elsewhere in Ukraine," Anders Fogh Rasmussen said, speaking in Brussels. Ukraine was a "valued partner" for Nato and should be allowed to determine its own future, he said. So in Ukraine is that what Russia intends to do too? Take Crimea and Russian speaking regions under its control, effectively dividing Ukraine in half?" What next for both sides? US Secretary of State John Kerry warned Moscow might be ejected from the G8 for its actions but his German counterpart, Frank-Walter Steinmeier, argued for Moscow's continuing membership. "The format of the G8 is actually the only one in which we in the West can speak directly with Russia," he told the public broadcaster ARD. US President Barack Obama called Russian troop deployments a "violation of Ukrainian sovereignty". Ukraine has ordered a full military mobilisation in response to Russia's build-up of its forces on the Crimean peninsula. Prime Minister Arseniy Yatsenyuk has warned the country is "on the brink of disaster". In Crimea, Ukrainian soldiers faced off with Russian soldiers surrounding their bases on Sunday while the Russian army was said to be digging trenches on the border with mainland Ukraine. Admiral Yuri Ilyn: "I'm very sorry that Ukrainian soldiers and sailors are hostages of this situation"
The UK has joined the US, France and Canada in suspending preparations for a summit of the G8 in Russia in June. Nato, of which Ukraine is not a member, is conducting emergency talks. 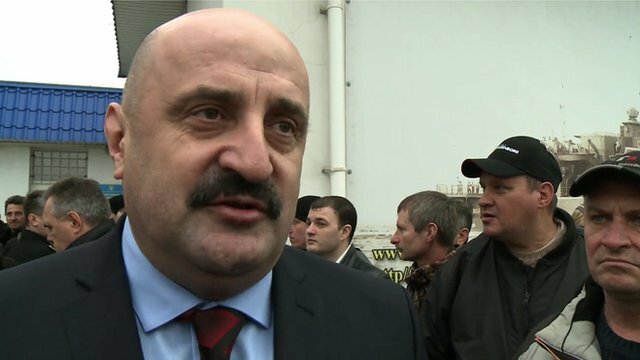 Admiral Berezovsky appeared in Sevastopol before cameras alongside Sergiy Aksyonov, the pro-Russian politician elected by Crimea's regional parliament as local prime minister. Mr Aksyonov announced he had given orders to Ukrainian naval forces on the peninsula to disregard any orders from the "self-proclaimed" authorities in Kiev. Sunday, he said, would go down in history as the birthday of the "navy of the autonomous republic of Crimea". The admiral then pledged to "strictly obey the orders of the supreme commander of the autonomous republic of Crimea" and "defend the lives and freedom" of Crimea's people. Admiral Berezovsky was later sacked by interim Ukrainian Defence Minister Ihor Tenyukh and a treason case launched against him. Nato: "Call on Russia to withdraw its forces to its bases"
Ukraine's Ukrainska Pravda newspaper reports that the admiral was speaking before the "numerous cameras of predominantly Russian TV channels". Earlier, Ukrainian naval officers found their headquarters in Sevastopol occupied by Russian troops and were unable to go to work. Separately, Ukraine withdrew coast guard vessels from two ports in Crimea and moved them to other bases in the Black Sea and Sea of Azov on Sunday. Several Ukrainian army bases were surrounded by Russian troops on Sunday but there were no reports of clashes despite the refusal of Ukrainian soldiers to open their gates. 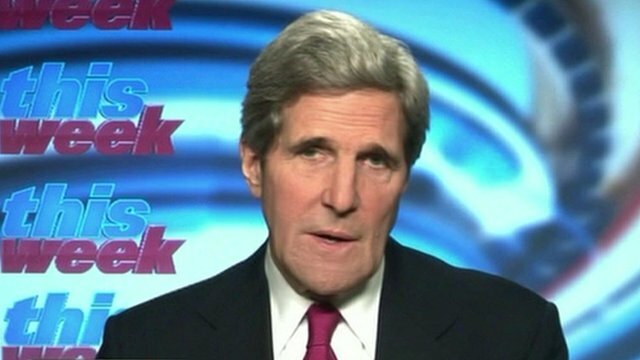 Mr Kerry told US media Russian President Vladimir Putin might "find himself with asset freezes". The Russian leader defended his decision in a phone call with German Chancellor Angela Merkel on Sunday, saying "ultranationalist forces" in Ukraine posed an "unrelenting threat of violence" to "Russian citizens and the whole Russian-speaking population". Thousands of people took part in a march in Moscow in support of military action while police broke up small anti-war protests in the city. John Kerry: Russian troop movement is a "brazen act of aggression"
Veteran Russian rock musician Yury Shevchuk has condemned "warmongering radicals" on both sides. Moscow has not recognised the government which took power in Kiev last month after overthrowing the elected pro-Russian President, Viktor Yanukovych. Mr Yanukovych's decision in November to abandon closer ties with the EU in favour of Russia sparked massive protests in Kiev, which ended in a bloodbath, as dozens of protesters were shot dead in clashes with police.